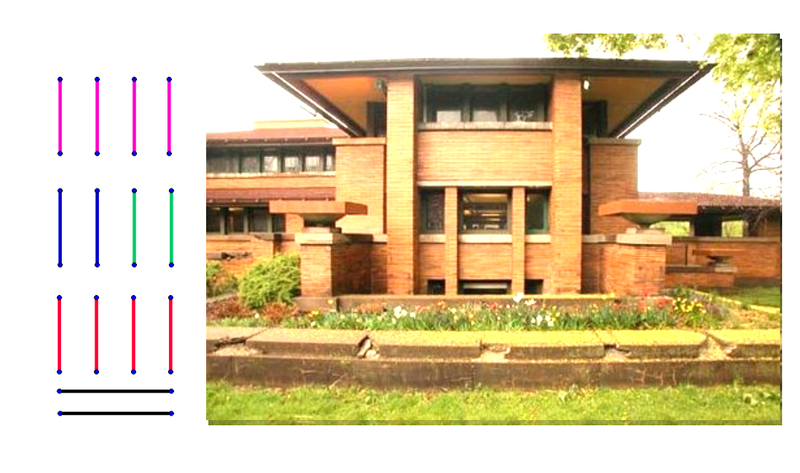 On the GeoGebra page is a photo of a house designed by Frank Lloyd Wright, a very famous architect. Find two different sets of perpendicular lines within the photo. Use the MOVE tool to move and re-size the red line segments to identify the perpendicular lines you found. Find two different pairs of parallel lines. Use the purple lines to identify these parallel lines. Use the blue lines to identify an acute angle in the picture. Use the green lines to identify an obtuse angle in the picture.Use the black lines to identify a right angle in the picture.